We have recently expanded our range of children’s bedroom furniture, meaning that there is now a host of colours and modern styles to choose from! Each style has been designed to add a splash of colour and practicality to bedrooms. The Cheyenne Collection of furniture is made from white melamine, with painted MDF storage features. Choose from a range of colours to really customise your child's bedroom. 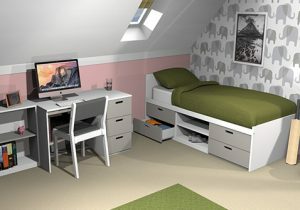 This collection boasts a range of matching furniture including beds, wardrobes, desks, chest of drawers and storage units. Each item of furniture is designed with durability in mind including metal easy glide runners on drawers and dove tailed joints meaning that this collection of furniture is ideal for withstanding the rigours of daily use. The Cheyenne Storage Bed and Cabin Beds are available with pink drawers, just the right amount of colour to brighten a room. Called raspberry pink for a reason this colour is sure to pop. Matching the collection is our children’s wardrobes, a stylish, compact double wardrobe for kids; this wardrobe helps to organise storage space with pigeon hole shelving to one side and one hanging rail to the other. The colour pink is thought to create a calming and reassuring feel to a bedroom, plus we think that girls of all ages would love the colour on this bed! Another option for the Cheyenne Collection is Stormy Blue. A beautiful light blue, this colour is ideal for boy’s bedrooms. Ideal for bedrooms that have a neutral décor, this colour will sit well with in it. Blue placed in bedroom is thought to create calmness and serenity, meaning that (fingers crossed!) it will help to make your little one more relaxed at bedtime. The Cheyenne Storage Bed and Cabin Beds are available with grey drawers, just the right amount of colour. A popular and on trend colour at present, grey is a perfect colour for both older boys and girls bedrooms. Again grey is ideal for bedrooms that have a neutral colour scheme. With grey being a neutral colour it means that it sits well with pastel tones and brighter colours around the bedroom. Add colour to walls and other areas in the bedroom such as the carpet or the curtains. Yellows, pinks, purples and greens all contrast well with grey. Meaning that this bed will be versatile in many environments. The Cheyenne Collection Storage beds and Cabin beds are available in all white. An all-white bed is a versatile piece of furniture. It suits many decors, and is also very on trend at the moment. Our most popular beds over the years have been all white beds, with customers loving the fact that they can change the décor of their bedroom at any time and the bed still sitting well with many colours. Find out more information about the Cheyenne Collection on our website or call our team to find out more. Please note colours may vary depending on screen resolution. Please request sample colours from our team to view an accurate representation.